This Symposium focused on two themes: biblical interpretation and use of the Scriptures in theology. Its aim was to help participants appreciate more fully what we are doing when we say, “That passage means…” or “The biblical position on that would be…” and to think about what kind of life the church should be embodying and proposing in order to be faithful to the Scriptures. Stephen Fowl gave a perspective on Scripture and the church from outside the Lutheran tradition. Two plenaries described the use of the Scripture within the LCMS: Joel Okamoto spoke on “Scriptures and their Uses,” and Timothy Saleska focused on “Interpretation in Communities.” Joel Lehenbauer, executive director of the CTCR, and Charles Arand and Paul Raabe, both drafters of recently published documents, discussed the use of Scripture in CTCR documents. Three new “study Bibles” were also be discussed, led by David Schmitt, Matthew Hoehner, and Mark Hoehner. Following the plenaries, participants had the opportunity to participate in faculty-led discussions of the presentations (these were not recorded). The sectional presentations dove into specific questions: How does Scripture function in a divided church? How has Scripture been used in the doctrinal statements of the LCMS? How can Scripture be authoritative when its canonical shaping and precise textual wording are not fixed? What does it mean to say that “Christ is the center of the Scriptures?” Looking ahead to the 2011 Theological Symposium on “Scripture in Preaching,” David Schmitt concluded the Symposium’s discussion with a reflection on the preaching task. Stephen Fowl, Ph.D. is professor of theology at Loyola University Maryland where he has taught for 22 years. He has written widely on the relationships between Scripture and theology. His most recent books include Philippians (Two Horizons New Testament Commentary Series) (Eerdmans, 2005); and Theological Interpretation of Scripture (Cascade Companions) (Cascade Books, 2009). Dr. Fowl is an Episcopal layperson and he preaches and teaches in a wide variety of church-based contexts around the country. Dr. Fowl, his wife, and their two sons live in Baltimore and worship at the Episcopal Cathedral there. 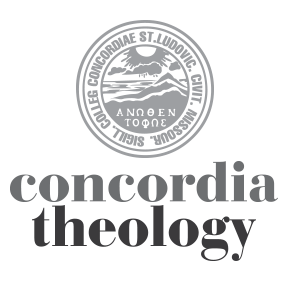 You can download these videos, as well as audio-only versions, and more at Concordia Seminary on iTunesU. Christians claim to use the Scriptures in many ways. They do so, to cite a few obvious examples, whenever a preacher says, “The text for the sermon is…”; whenever a congregation holds “Bible classes”; or whenever someone defends a position by saying, “As the Bible says…” But when the meaning a preacher derives from the biblical text seems contrived; when a Bible class cares more about what participants think about what the Bible means than what the author meant; when a proof text seems irrelevant to the issue at hand, we wonder, even doubt, whether that claim is serious. Of course, such things should not be, and we should take care in our own lives to use the Scriptures responsibly. But what does it mean to use the Scriptures responsibly? It is easy to offer many examples of responsible and irresponsible uses, but it is much harder to explain “responsible use” more generally. To this one might reasonably ask, “Does it matter?” As an introduction to this year’s Theological Symposium, this presentation will defend a “Yes” answer to that question; suggest a couple of general ways about how to think about uses of the Scriptures; and commend a few questions and issues for further thought and reflection. This essay addresses the questions: In our interpretation of the Bible, why are there so many disagreements? How do we settle them? When we argue about how a text should be interpreted, what are we arguing about? After discussing what the object of interpretation is, the essay addresses the reasons for interpretive differences and then discusses how Christians should interpret the Bible. It is hoped that the audience will come away from the essay with a clearer understanding not only of what we actually do (and cannot avoid doing) when we interpret, but also with what we as Christians should do when we interpret the Bible and why. Over the past 15-20 years biblical scholars and theologians have engaged in a lively discussion about reinvigorating theological interpretation of Scripture. In some respects this represents an odd discussion since Christians have never stopped interpreting Scripture theologically. At the same time, anyone acquainted with scholarly work in theology and biblical studies will recognize that these two disciplines often struggle to keep each other at arm’s length. Seminarians and pastors feel this separation more than most. If we are to begin to think about reinvigorating theological interpretation of Scripture, it will be important to begin to think theologically about Scripture. In this way we will be able to put Scripture into its proper relationship to the Triune God, and to the Christian life. Doing this will help Christians see that they are called to interpret, debate, pray over, and embody Scripture as a way of advancing toward their true end of ever deeper fellowship with God and each other. To use images that St. Augustine first employed in On Christian Doctrine, Scripture is the vehicle that God provides for us to travel to our true home along the road established by the life, death and resurrection of Jesus. In the light of such an account of the end of the Christian life and in the light of this account of Scripture and its place in God’s ongoing drama of salvation I will begin to offer an account of theological interpretation of Scripture. That is, theological interpretation of Scripture will involve those habits, dispositions and practices that Christians bring to their varied engagements with Scripture so that they can interpret, debate, and embody Scripture in ways that will enhance their journey toward their proper end in God. This “trifecta” presentation will explore the way(s) that various CTCR documents over the years have approached and made use of Scripture in addressing theological issues as requested by the Synod. Dr. Joel Lehenbauer, Executive Director of the CTCR, will attempt to identify and explain how Scripture has functioned in the theological methodologies employed by the Commission in preparing its documents. Dr. Charles Arand and Dr. Paul Raabe will provide “case study” examples based on their experience as members of the CTCR and drafters of (or contributors to) specific CTCR reports. Time will also be set aside for moderated discussion and Q&A. When you open a study bible, you encounter more than the Scriptures. You encounter essays and prayers, exegetical insights and contemporary applications. How do the materials that publishers append to the Scriptures shape the way in which God’s word forms God’s people? This presentation will consider that question by examining three recent study bibles: the ESV Study Bible (Crossway, 2008); the Lutheran Study Bible (Augsburg, 2009); and The Lutheran Study Bible (Concordia, 2009). Although the Church in the west has been divided for nearly half a millennium, I think we are still in the position of learning how to understand our divided state. It is tempting to think that differences over Scripture and its interpretation and embodiment lie at the very heart of church division in the West. In this talk I will try to show that this is not true. Disputes over Scriptural interpretation are only divisive in the absence of a variety of other practices. I will explore the nature of these practices and use Scripture as a way of trying to understand our divided state properly. Forty gospels and five thousand manuscripts — how can we possibly know what is in the Bible? And if we can’t know exactly which books and words are God’s Word, then can any of it be authoritative? Recent books and videos, both popular and scholarly, use the issue of the canon and text of the New Testament to disavow the authority of Scripture. Responses — both helpful and unhelpful — will be discussed, as well as the Implications of our view of the nature of Scripture and its authority for how we read the Scriptures. The literary theory of intertextuality has had significant impact upon biblical studies in recent decades. While rival understandings of the discipline exist, the prevalent use of intertextuality focuses upon the reader as the determining factor within intertextual readings. This paper offers a critique of that approach and suggests an intertextual practice that places chief authority in the text while still recognizing the role of the reader.